One of the downsides of riding a motorcycle can be its lack of storage area. A car, of course, is a living-room on wheels with enough free space to load a mountain of shopping, a large dog and a couple of kids. In the absence of a pannier system or a tank-bag the only other place to store anything on a motorcycle is under the seat or in the glove box. That’s fine if all you wish to protect from the elements is a pair of Oakley’s or a small cheese and pickle sandwich. Mountaineers and soldiers manage to carry huge loads on their backs while walking and climbing. Water-skiers can even carry their girlfriends upon their shoulders. Sitting still on a motorcycle with nothing more than a laptop and a change of clothes to carry shouldn’t be any great stretch. This backpack is ideally suited to UK road conditions and will get the job done in any weather. While the idea of a backpack is pretty obvious you should think twice before digging around in the attic for your ten year-old Karrimor Papoose or that old rucksack you had in the boy scouts. You remember? The one which towered above your head as you walked to the coach station, bent double under the weight of tents, sleeping bags and two week’s food supply. 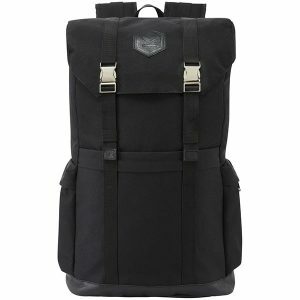 Before choosing a backpack to wear on your motorcycle there’s some extra considerations above and beyond a walkers backpack. A backpack shouldn’t inhibit your control or cause any balance problems when riding your motorcycle. 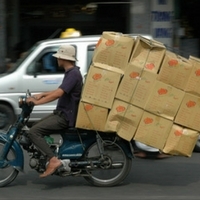 There is a limit to what you can safely carry on your back. Youtube is awash with riders in far-away countries counting goats, sheep and small horses as pillion passengers. Fridges, gas bottles and precariously-mounted ladders also feature among this array of mini-freight that would most likely earn you a few license points here in the UK. Motorcycle jackets are often thick with padded shoulders and elbows. You need a backpack that is both easy to put on and tighten once in place. Well-positioned straps ensure that the load is spread evenly to avoid heaviness and tension around your arms, neck and hips. As for pillion passengers, better they wear the backpack in order to keep tight up against the rider. Some backpacks may also be attached to the rear of the saddle with correct and effective safe use of their straps and retainers. Many motorcycle backpacks are waterproof or at least shower-resistant. If not, they’re still useful as long as you place any vulnerable items like laptops or paperwork in an interior form of waterproofing (a plastic bag will do!). Some models come with separate external covers which you can utilize in wet weather. What will you carry and how quickly will you need to retrieve it? Easy access zipped compartments allow you to store and retrieve small items without rifling through your mother lode. Avoid anything with long-flailing straps which can ‘whip’ around at speed and cause distraction. Some models have restraining clips to aid streamlining. A big internal single compartment may cause items to settle near the bottom with gravity. Look for models that have separate baffle areas like pockets or mesh sleeves. These help balance things out and make the job of finding your items easier. Will you just be carrying a bottle of mineral water and a security lock for the office car park or something more substantial? Assuming you’re happy with the weight then check out the different sizes of bags. Anything bigger than you need may cause drag, inconvenience and distraction. The carrying capacity of some models may be increased with add-on pockets or compartments such as helmet-carrying sections. Let’s take a look at our top five motorcycle backpacks. 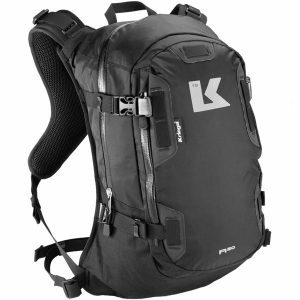 Coming in at 28 litres is the very stylish Knox Studio Rucksack. Its leather-like exterior gives it an executive look like a smart commuting bag. Despite appearances the Knox Studio Rucksack is fully waterproof and constructed from 600 denier nylon and leather. Outside storage is available with three, deep pockets. Further thought has gone into the top and bottom design to prevent water seepage when exposed to ground puddles or excessive rain. With motorcycling in mind the harness has padded and adjustable shoulder straps. Chest straps are also adjustable and include those useful restrainers to prevent the flapping of loose ends. The same goes for the generously sized waist strap which helps lift and spread heavier loads. Comfort and airflow is aided with two, spacer fabric panels on the back. Overall, the Studio Rucksack is roomy, smart and suitable in all weathers making it an ideal mid-priced backpack both on and off the bike. The R20 is aerodynamically shaped for the motorcycle rider. Its curves and straps give a beautifully streamlined look to this 20 litre backpack. The ‘webbing’ is unique – a Quadloc-lite harness system. The adjustable side straps can be joined across the chest by a clickable connecting clip which is also adjustable. The backpack can be lowered or raised and an optional waist strap further absorbs heavier loads. All in all, it won’t move around and once in place there’s little of the re-adjustment typical of regular backpacks. A raised mesh-like exterior against your back helps prevent sweating on those long journeys. Extra capacity can be achieved by add-on 5 or 10 litre dry-packs. Further optional accessories include a harness pocket and a 3 litre hydration reservoir. The Oxford Aqua B25 gives you more backpack for your money and its waterproof. As the model name suggests you get 25 litres. The bag is shaped… like your back; narrow at the bottom and wide at the top. There are plenty of external zips and pockets on the sides and rear-facing areas. The top of the bag is a fold-over design offering further protection against the rain. The B25 is sold as ‘suitable for motorcycles’. Consider this an advantage as bespoke motorcycle products are usually more expensive. The height and width adjustable straps should ensure that its extra bulk and size stays firmly in place. The grab carry handles are great for those quick pick-ups from the floor when you’re leaving the coffee shop. The Held Bayani Rucksack has no less than seven retaining straps to compress the bag. In other words with a near empty bag you can reduce its size and prevent drag. For full loads these straps keep everything nicely compressed. With internal compartments and three external pockets you can spread your items around conveniently. A detachable pocket allows quick and weatherproof retrieval of your valuable laptop. Waterproofing comes in two ways: a PVC coating and a built-in rain cover for the whole bag. The chest and waist straps together with padded back and shoulder straps secure the unit comfortably and safely to the rider. It also has cable ducts for navigations systems and an aperture for a hydration system pipe. 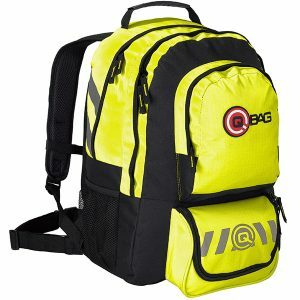 The biggest and cheapest in our reviews of motorcycle backpacks is the QBag Backpack 10. 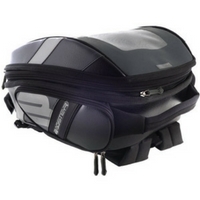 Its 30 litres capacity is spread over three compartments and four outside pockets. Larger loads can be evenly distributed with the use of the front cross-connection harness. Shoulder and waist straps are padded and adjustable. The backpack may not be ideal for carrying laptops and other sensitive items due to its lack of internal cushioning. It is also not sold as waterproof but with care and common sense it will do the job. The bright yellow colour provides excellent high-visibility. There’s more to a backpack than just size and appearance. Hydration, phones, weather, navigation and access all come into consideration. Our review models cover many of these but my personal top two are the Kriega R20 Back Pack and the Knox Studio Rucksack. The Kriega is military grade and built to last. Whilst small, I generally don’t carry much on my back anyway but it’ll hold a laptop and some personal accessories. The R20’s strapping harness is so comfortable you’ll forget you’re even wearing it. In first place however is the Knox Studio. It’s bigger but avoids the bulky appearance you get with the more ‘camping styled’ backpacks. Being waterproof is a must in the UK and with a very stylish look you can use it for any occasion. At some stage you’ll reach your limit with what you can carry on your back. 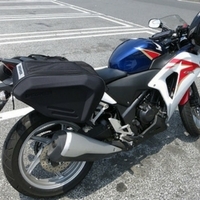 The introduction of large volume pannier systems in conjunction with tank-bags and top boxes can put you at a similar carrying capacity to that of a small car. Not for everyone but dispatchers, long distance tour riders and big bike enthusiasts can shift hundreds of pounds comfortably across hundreds of miles. For now, there’s plenty of great quality, multi-sized backpacks available to suit any budget.